As well as our standard analogue CCTV solutions that we provide, we can also provide you with state-of-the-art High-Definition (HD) Megapixel CCTV systems, giving a resolution at least three times greater than its analogue counterparts. In the example of a 2-Megapixel camera being compared to an analogue camera, the resolution is 5.5 times greater! This allows for a clearer picture, gaining far more detail than would be possible with an analogue system - ideal for identification of people and objects. The above image clearly demonstrates the amount of detail available in an IP Megapixel system over a standard analogue system. To be clear, the above image has been shrunk in size in order to fit it on to this web page. 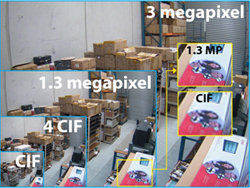 Criminals are becoming increasingly aware of the differences between analogue and megapixel cameras, and the detail that megapixel brings - what they might get away with in front of analogue cameras is far less likely in front of a megapixel camera. Burglar Alarms, Home Residential Alarms, Commercial Security, Business Commercial Alarms, Security throughout Glasgow, Edinburgh and Central Scotland. Copyright © 2019 Tyger Security Ltd.